All ready to be eaten. All harvested from their branches and sampled by yours truly. It just so happens that the trees on which these fruits happily grew are situated beside the road on my running route. I am still in complete awe at the copious amounts of fruit trees, olive groves and vineyards that are dotted around the countryside through which I run every Monday to Friday after dropping Luca and Beni off at school. The beauty of the countryside surrounding our village, so lush and green, is such a joy to run through every day. Even the many many steep hills that I push the buggy up cannot taint my appreciation and wonder of this beautiful land we are so blessed to be living in. Today the air was crisp, still and oh-so-clear. Before I knew it I had run up the hills which I normally need to stop and catch my breath on. My mind and heart were singing the praises of the beautiful day and spectacular views. Max was sleeping soundly - as always - lulled into sleep by the familiar tapping of my feet on the road and rhythmic breathing to match my footfalls. Even the nasty little yappy dogs stayed away today. Maybe someone ran over them, like I always threaten I will do - come back in the car and "deal" to them. It feels so great to get back into running as part of my every day routine. Those good-feeling endorphins are addictive. As is the rapturous joy of seeing my waistline and arse finally start to shrink back down to a more pleasing size. ARGH! That's it. 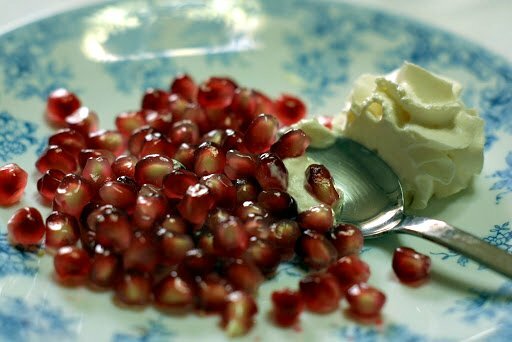 I'm booking a flight so I can sample the pomegranates. Oh, and to see you. And to tell Max to stop growing up so quickly. 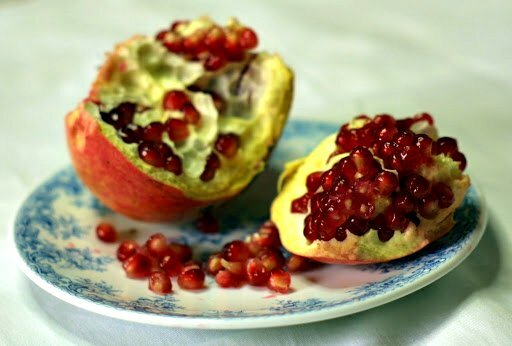 We have tried the pomegranates here - do you swallow all the little seeds??? Rebekah (& Freja ) would be very proud of your harvesting technique. Keep those blogs coming.Love DAD.